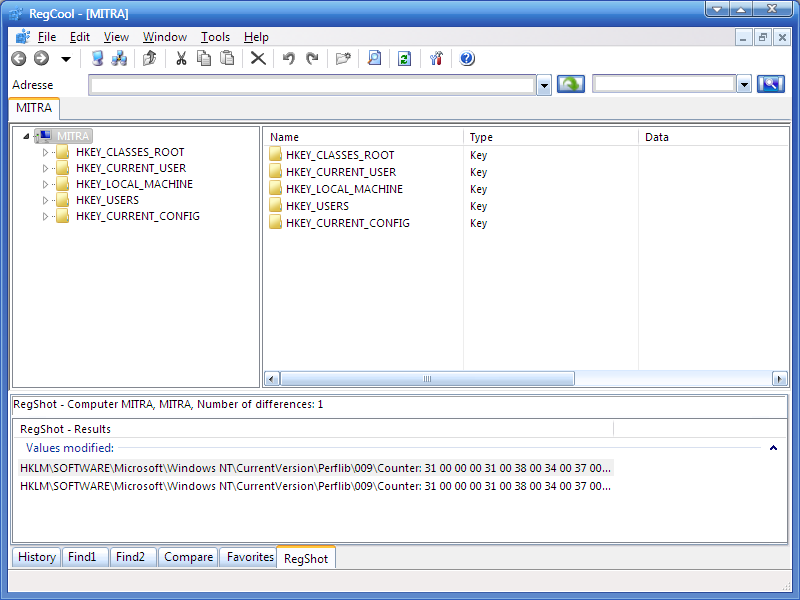 RegCool is a full-featured Registry editor and manager. · Copy and paste security permissisons. · Search and replace registry keys, values and data with super fast search algorithm. With RegCool, you can search the entire registry in about 10 seconds! Last edited by JohnW on Tue Jun 27, 2017 4:55 am, edited 1 time in total. I have tried the portable version of RegCool v. 3.629. 1. when it start it need some time: is it nagware? 2. in the splash screen is showed the expiration date: 29/12/2008: is it a trial? 3. tha program start in german and it is not simple to switch to another language: You must search the button 'optionen' (next to last button on the right of second row from the top) and press 'Sprache', in the 'Sprachauswahl' menu You choose the english language and confirm. I think that is a test-drive version before to release a shareware version. 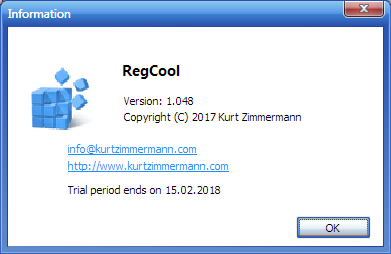 Topic update: RegCool v1.048 released (changelog at https://kurtzimmermann.com/regcoolversions_de.html). NOTE: there could be a version mismatch here that I am unable to verify. RegCool was mentioned along other Kurt Zimmermann programs at viewtopic.php?t=23449. Further info follows. Download RegCool latest 32 or 64-bit portable version (untested!) from https://kurtzimmermann.com/index_d.html#features6-0. @webfork: I suggest a move to "Portable Payware" for the time being. Removal of version info from OP subject would also be welcome. Thanks. I had already noticed the issue of a trial period mentioned by Midas, and tried to query this with the developer but elicited no response. Very strange as there seems no means of providing payment. Just to reiterate a comment I made in my HdCleaner post, the PortableUninstall program included in RegCool is useless. I was somewhat surprised by the comment to the effect that the snapshot was saved to the program folder; is it also saved in AppName etc? Overall I think it a pity that the author has made no effort to make his programs close to stealth. Aside from this, they are worthy additions to any toolkits! Last edited by JohnW on Fri Dec 22, 2017 3:13 am, edited 1 time in total. JohnW wrote: I had already noticed the issue of a trial period mentioned by Midas, and tried to query this with the developer but elicited no response. Very strange as there seems no means of providing payment. That is puzzling! Might it be a convoluted scheme to allow for future commercialization? JohnW wrote: Just to reiterate a comment I made in my HdCleaner post, the PortableUninstall program included in RegCool is useless. Due to the briefness of my testing, I'm not grasping the issue with PortableUninstall, which I didn't try, but I can positively confirm that no copy of the RegShot report was saved to '%APPDATA%'. JohnW wrote: Overall I think it a pity that the author has made no effort to make his programs close to stealth. I completely agree, the joining of registry editing and snapshoting looks like a winning combo, IMHO. May I request again that you remove the ' v 3.620' string from the subject of your original post in this thread so it better reflects the fact that it is the official forum topic for RegCool? Thanks in advance. RegCool Beta v1.060 released, dated 2017-10-10 (changelog at https://kurtzimmermann.com/regcoolversions_de.html). FYI, if you run a previous version it will offer to update itself upon checking for updates. Midas wrote: @webfork: I suggest a move to "Portable Payware" for the time being. Removal of version info from OP subject would also be welcome. Thanks. Took me a bit but I finally got it.